An informal presentation ceremony was held at the Town Hall last evening when members of the Devizes Food and Drink Festival organising committee handed over donations for this years good causes. 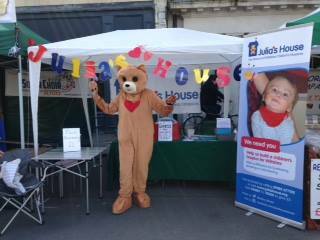 In addition to this in 2016, we provided a stall for Julias House Children's Hospice at the Grand Market in May and made a donation to Devizes Budo Club for their help in distributing Festival Programmes to houses in the town. Approximately 50% of the Festival surplus this year was passed on to local good causes, the rest has been retained to make next year's Food Festival even better and as a reserve for when we have to replace costly items like street banners and our sound system.